On Friday John Howell MP visited Fairmile Vineyard in Henley after an invitation was offered to come and see the new vineyard by owners. Jan and Anthea Mirkowski. John wrote to Jan last year to congratulate him on the first harvest of the grapes. Jan and Anthea bought the property and land at the Fairmile Vineyard in 2014 and in May of that year planted 12,000 French vines on seven and half acres of the sloped land. They are planning to produce sparkling white and sparkling rosé wine. Jan told us that the grapes are looking good for the second harvest which should take place in a few weeks. John said, “It is really impressive and a brilliant addition to Henley.” As well as wine Jan hopes develop a wine tour with other local vineyards. 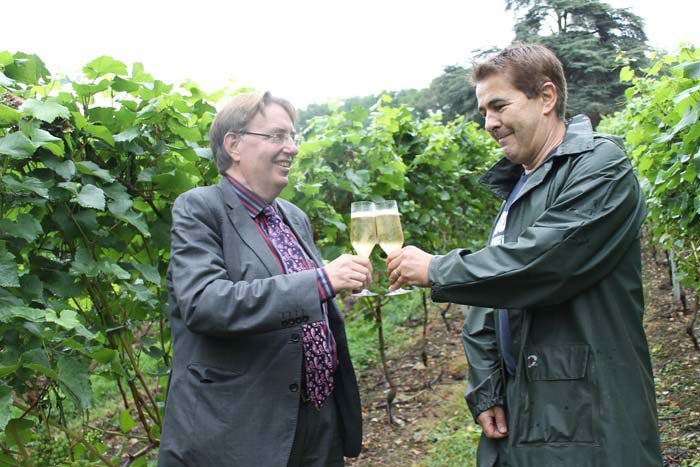 John and Jan shared a bottle of Hambledon sparkling wine from Hampshire, the winery where the Fairmile Vineyard grapes will be pressed and bottled. Jan Mirkowski said, “Anthea and I were delighted to welcome John and Angie to Fairmile Vineyard and to show them how the vines are progressing. We look forward to being able to share a bottle of our sparkling wine with them once it becomes available in 2018!”.